I made a mess! I spent most of my time looking for this contraption that goes into the lid of this jar I was using to ferment the cabbage. I figured I still had time to make it- how hard could it be to cut cabbage? Well.. lol.. I forgot I also had to crush it. Being that I was running late now for the gym- I took advantage of the crushing of the cabbage to create some liquid. This was actually harder than I though and I used this time as an arms workout since I was late for my routine at the gym. First things first– I washed the cabbage. I used 5-6lbs of green cabbage. I took the outer layers off and kept then on the side for sealing the cabbage in the jar later. I cut the cabbage into 4 pieces length wise and cut out the core. Then I cut thin strips. All the cut cabbage went into the mixing bowl- I actually used two. Then I added 3 tablespoons of sea salt– 1 1/2 to each bowl. hmmm- there was no liquid forming yet.. lol. I began to crush the cabbage and salt mix with my hands- still nothing! I kept switching bowls and hoping for a miracle. 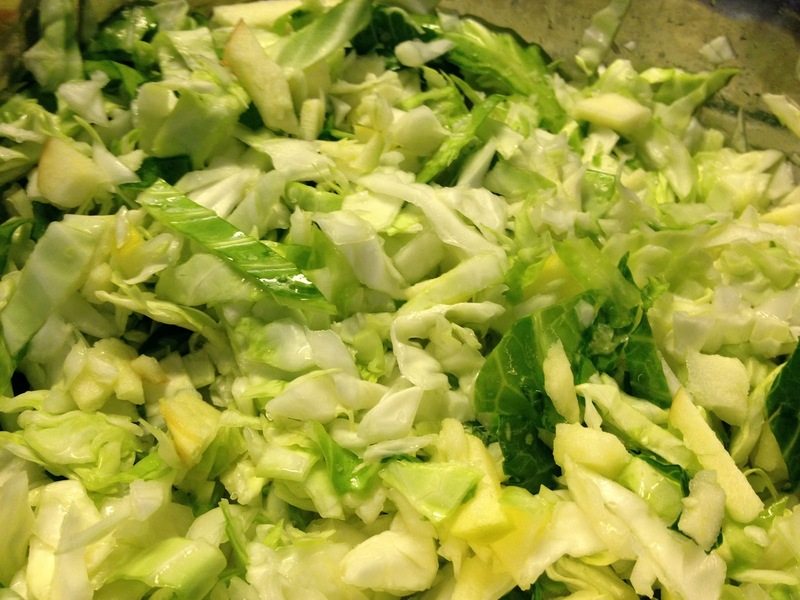 The cabbage gets submersed in the liquid and then stored for 7 days- but I wasn’t at that point yet. I decided to cut up an apple- I peeled it and sliced it into thin pieces. I crushed.. and I crushed! It seemed easier in class- they didn’t add any water although I read that you can do that. I added a tiny bit- like 1/2 cup to each batch. It was getting there but the water helped a bit- of course! The cabbage does get softer creating a little juice. 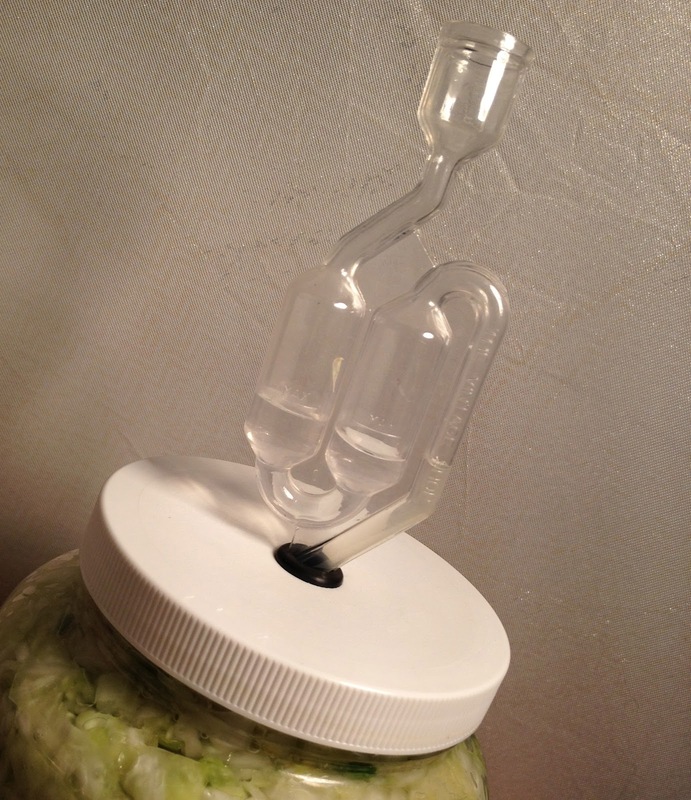 After crushing for much longer than I thought- I stuffed the cabbage into the fermenting jar with the funny looking plastic tubing on top. Earlier I had boiled the jar and top so that everything was super clean for fermenting purposes. I had more left over so I used a small mason jar and stuffed the rest in. There was enough liquid to cover both jars so I did not need additional water but do so if you must. 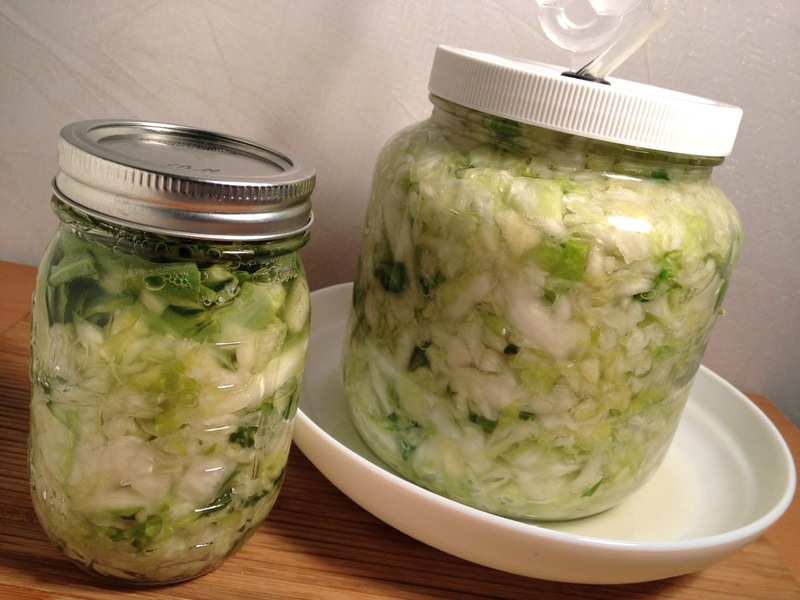 I took those beginning pieces of hard cabbage and sealed both jars with that and then put the lids on. Now I wait 7 days!